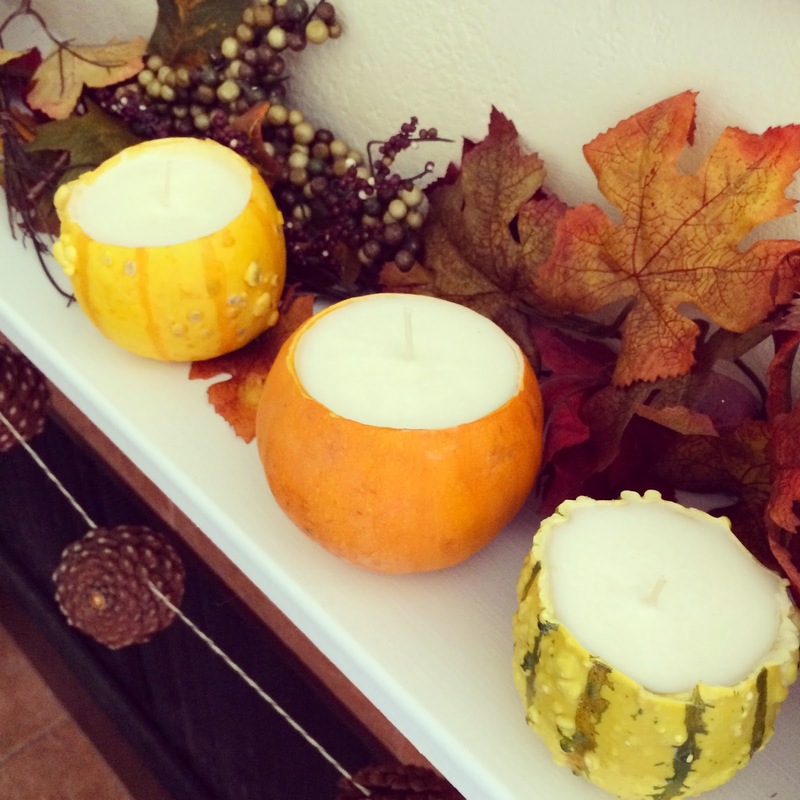 Think of this DIY as the adult version of pumpkin carving! I had some left over wax from my lotion bars that I was looking to use up, and I had planned to make some sort of fall candle. 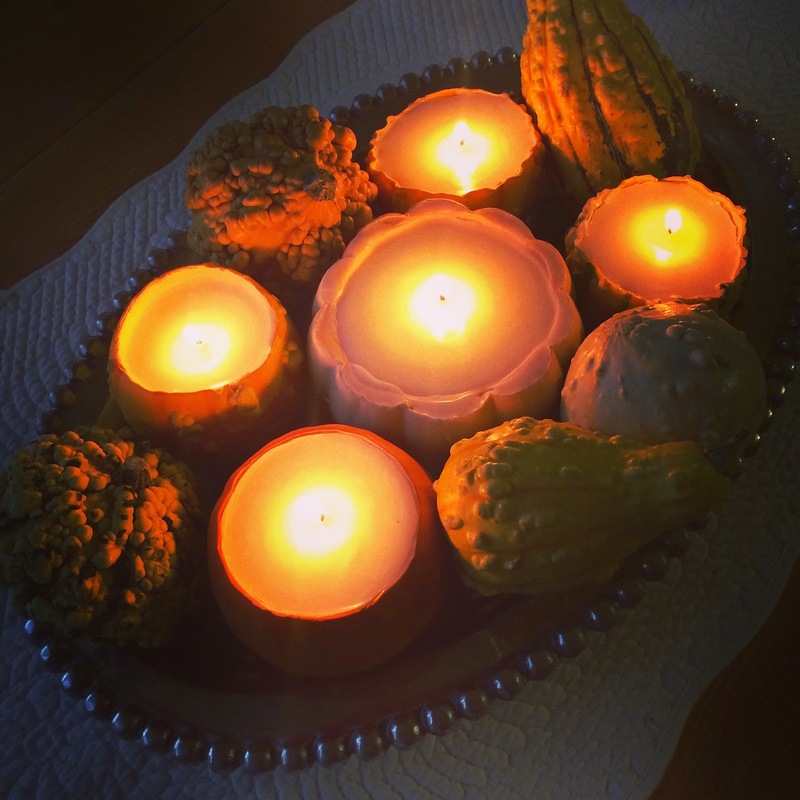 While I was looking for inspiration, I came across the brilliant idea to use gourds for the shells of the candles. I didn’t have enough wax leftover to make as many candles as I wanted to make, so I bought a 2lb bag of soy wax from Hobby Lobby for $9.99 (and then you can use your 40% off coupon on top of that! ), I also bought 5 long wicks for $2.99… so it was quite an inexpensive DIY – the gourds were the most expensive part! 1. Begin by picking your gourds and washing any dirt from the outside. Make sure to pick gourds that stand up very sturdily. 2. Next, cut the top of the gourd off, and clean out the inside seeds and gunk. Make sure you do a very thorough job getting the inside clean… you don’t want any remains getting into the wax. 3. After the insides are cleaned, start to melt your wax. I melted mine in the microwave, but a double broiler works great too. Once the wax is melted, you can add any sort of candle scent that you want (this part is optional). I added an apple pie scented oil that was only $2.99 from Hobby Lobby – it smelled like heaven! 4. 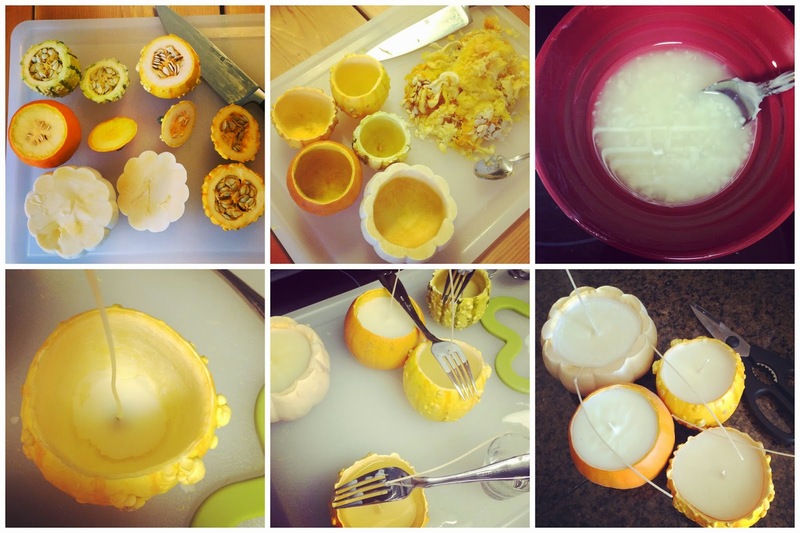 Place your wick in the center of the gourd and pour over some melted wax with a spoon. Hold in place until the wick sets in place with the dried wax. Once it is dry, add a spoonful more and let dry. Repeat 3 or 4 times. 5. Once the wick is anchored by wax, slowly pour in wax to fill the remainder of the gourd (I used forks to help keep my wick straight). Once the wax hardens, you add another spoonful of wax to the top to fill in any cracks. To make 5 medium size gourds, I used about 1.5lbs of wax. 6. Let sit for 24 hours before burning. Finish by cutting the quick to about a 1/4-1/2 inch. Keep in mind that these are fresh gourds, so they aren’t going to last forever... My small pumpkin started getting soft in 4 or 5 days, but the gourds lasted much longer. You can probably count on them lasting 1-2 weeks (but hey, there is some luck involved with getting good pumpkins/gourds). You can organize these pumpkins into a mantle display or arrange them with other gourds for a beautiful fall centerpiece. These would also make awesome hostess gifts! Beautiful, easy, and autumnal - sounds like a winner to me! These are amazing! I love how easy and beautiful they are! How cute are these?! Love that last picture with them all lit up. Nothing better than candlelight! These are so great!!! I don't particularly like pumpkin carving - so something smaller like this would be right up my alley! So cool, I love these! You are so crafty! So far today I have found a cheesecake I will make this weekend and now you have given me a craft! I cannot wait to try this with my daughter! What a great idea! How gorgeous! You are so creative! Love this, and so easy too! I have the wax and wicks that I picked up awhile ago, but I haven't put them to use yet! Those are beautiful! I just MAY have to give these a try! WHAT AN IDEA!!! I love this and will definitely be trying it! These are beautiful! You truly come up with the best DIYs! That is an amazing idea!!! So perfect... I want for a Thanksgiving center piece!!! Another winning DIY. I love how these turned out! You and your creative self! I absolutely love these! So, so cute. So glad you shared this! These are so cute, and perfect for this time of year. I actually have a bunch of wax and wicks from when I got the brilliant idea I would make candles for our wedding (I made one and was over it, haha). This is soooo cool! Sounds like DIY you can't mess up. And they look great! Thanks for posting! These are SO cool! I'm definitely making some of these. They are so beautiful! Those are so cute…. thank you for linking up with WYWW! I might just have to feature these! This is ridiculous! I love it! Need to do this. I'm not even in the right hemisphere (spring here in Australia) and people will be like who's the weirdo with the gourds, so don't care! 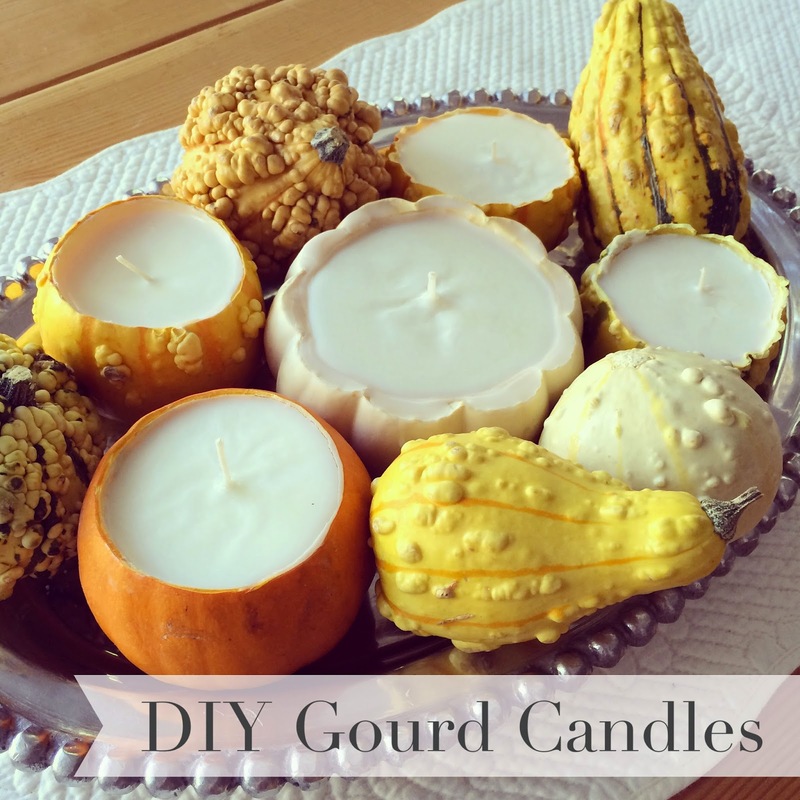 Question though, do the sides of the gourd got mushy as the wax melts? I just love these! Thanks for linking up! Such a fun idea! I love these! This is genius and so perfect for this time of year! These would be great around the house or as part of a thanksgiving centerpiece!